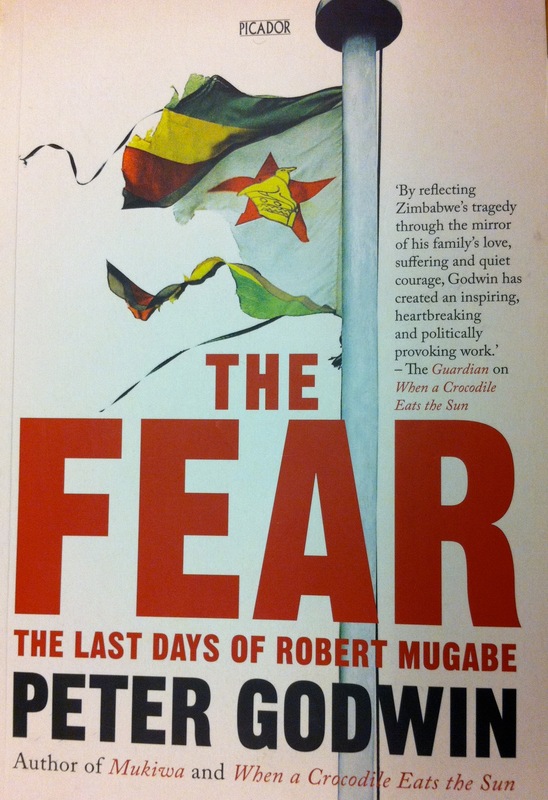 In his latest book, The Fear: The Last Days of Robert Mugabe, Peter Godwin delivers a superbly written account of contemporary Zimbabwean politics. But it is no pleasure read. We all knew that Mugabe was a bad guy, but Godwin bears witness to the almost unthinkable acts of terror that this dictator carried out against ordinary citizens and political activists. There is very little to smile or to laugh about, or, frankly, to feel hopeful about. Nonetheless, this is a necessary chronicle of how a man has managed to stay in power for more than 30 years, amassing great personal fortunes, even while social conditions have plummeted since the promising early years of independence. I met Godwin a few years ago when he was giving a talk at Princeton, and subsequently had a chance to meet with him about common interests in Southern Africa. It had been at least a year since I saw him last, when I was in Southern Africa this past November and saw him being interviewed on South African television. I was en route from Joburg to Zimbabwe to do a bit of work and research with a human rights organization there. Although his book was everywhere in South Africa, it was certainly nowhere to be found in Zim. A week and a half later when I was on line for my flight home I saw Godwin boarding the same flight and we took a cab home together, as we live in the same neighborhood, and he kindly gave me a copy of the book, which is the one I just read… finally, after too many months on my shelf. The American version is published by Little, Brown, and has a slightly different cover. Godwin was born and raised in Zimbabwe, and much of his and his family’s relationship with the country is chronicled in two earlier autobiographical books, Mukiwa and When a Crocodile Eats the Sun. Having worked as journalist, lawyer, soldier, and human rights activist, but living now in New York with his family, he writes as both insider and outsider, a patriot to some, a traitor to Mugabe apologists. The Fear intertwines just a bit of family portraiture – conversations with his sister and mother – with what is largely a chronicle of travels around Zimbabwe in 2008. Dombo’s was just one of many, many accounts of ruthless campaigns that resulted in crowded hospitals and widespread deaths. While Godwin recounts Mugabe’s many attempts to blame all the country’s current problems on the legacy of white rule, he makes clear that this claim has become stale in the wake of the regime’s legacy of deliberate destruction. The book offers no explanation for the Mugabe terror except for the insanity of the man himself. While there is surely something to the thesis of Mahmood Mamdani’s book, When Victims Become Killers, Godwin fingers most of the blame on a man whose traits and habits emerge as laughable as much as they are frightening. But he also shows that Mugabe has become an institution and has created a large enough cabal of dependencies that there exist reinforcing mechanisms maintaining his rule. As I read the book, a few things struck me as strange — which is not to say that I doubt they were true, but simply that they deserve further exploration. For example, on so many occasions, after acts of unspeakable state-sponsored violence, citizens would attempt to contact the police, and then almost invariably find themselves frustrated with the lack of interest or results. Why, in such a system, would citizens even surmise that they might receive any action? Perhaps they still just hope that the state can function for them as a source of justice, and they simply need a place to register that they have been victimized. On my brief stint to Zimbabwe, I was not even looking for evidence of state violence, and yet I found it. When visiting a small rural town in the Eastern part of the country, my colleague/host and I met with an NGO worker who trembled when recounting that the previous day he had unexpectedly been confronted with a small dose of the fear. He had been roughed up by a pair of “special police” for having helped to facilitate a play about political reconciliation. He described strange tactics, including the men later taking him for a beer. But he clearly feared for his life, worrying about whether or not they were trying to poison him, as he never saw the beer opened and wondered if they might have slipped something in the bottle. Undoubtedly, if the goal was to instill fear, the tactics had worked. There is a bit of irony to the back page which refers readers to the author’s website for suggestions about how to “help the people of Zimbabwe.” That website provides a few links to some Zimbabwean NGO’s. After reading the book, my conclusion was that until Mugabe’s truly last day, not that much is going to make a difference. With reports of Mugabe’s ill health and long-overdue pressure from regional neighbors, maybe that day will come soon.